Acolytes are youth and adults who assist in the celebration of the liturgies of the Church. Acolytes carry the cross and or torches in processions, assist with setting the Eucharistic table and assist the celebrant at weddings, funerals, and other liturgies. This ministry requires that the candidate be a baptized communicant in good standing. Younger acolytes usually serve as torch (candle), incense and banner bearers. Older acolytes serve as crucifers, thurifers and servers. All acolytes serve at the discretion of the rector. No previous knowledge is required. Discernment of call, training and vestments will be provided. Anyone interested in being trained as an Acolyte should call the church office at 656-6628. Lectors read the lessons from Holy Scripture and the Prayers of the People during the liturgy. Training will be provided to anyone who is interested in this ministry. A strong, articulate voice is required. Those who decide to be readers should be willing to commit to preparing lessons ahead of time so they are read well. All readers serve at the discretion of the rector. Anyone interested in being trained as a Lay Reader should call the church office at 656-6628. 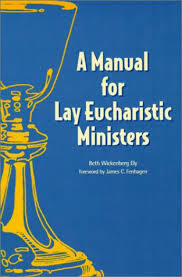 Lay Eucharistic Ministers (LEM’s) are lay persons who assist the clergy at the Altar and administer the wine during communion. LEM’s are needed for both the 8:00 and the 10:30 services. In addition to Sunday morning liturgies and special feast days, LEM’s are occasionally needed for weddings and funerals. Interested persons will received special training and are appointed and licensed by the Bishop at the request of the Rector. If you are interested in serving as a Lay Eucharistic Minister, please call the church office at 656-6628. Lay Eucharistic Visitors (LEV’s) are responsible for taking the Sunday Eucharist to parishioners who are not able to attend regular services in the parish due to illness. 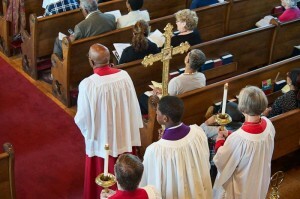 This ministry is always performed immediately following the Sunday Eucharist. This is a licensed ministry within the Diocese of Delaware and requires that the candidate be a confirmed adult member in good standing and a licensed Lay Eucharistic Minister (see above). Persons who have an existing ministry of visitation or pastoral care are especially encouraged to consider serving as LEV’s. If you are interested in serving as a Lay Eucharistic Visitor, please call the church office at 656-6628. Those who serve on the Altar Guild are responsible for preparing the altar, vessels, linens and vestments that are to be used for worship on Sunday and for special services. Members serve on a rotating basis. Responsible, organized, and detail-oriented people will find this a rich and rewarding ministry. No special knowledge is required to join. Training is provided and guild members provide fellowship and support. Anyone interested in serving on the Altar Guild should call the church office at 656-6628. This ministry is an integral part of all worship services at SsAM and is primarily a ministry of hospitality and service to others. Persons interested in serving as ushers will welcome people to worship and aid them in finding a place to sit and provide them with leaflets so that they may follow the service. Teens as well as adults are encouraged to consider this ministry. Families are welcome. No special knowledge is required to join. Training will be provided. For more information, please call the church office at 656-6628.